LONDON, ENGLAND—The Mayor’s Fund for London will join forces with the UK’s best-loved mathematician, Johnny Ball, to inspire London’s primary-school children to take part in a new math challenge. A total of 52 schools will take part in the COUNT ON US CHALLENGE, which is based on the 24® Game and the 24 Challenge®, created by U.S.-based Suntex International. British television personality Johnny Ball visits with children who are preparing to take on their best and brightest peers in a London-wide Math Challenge. The initiative is part of their wider Count On Us numeracy program aimed at motivating more than 3,000 children in 150 primary schools across the capital over the next three years. The top 13 schools will attend the Count On Us Challenge Final on June 10th, 2014 at City Hall. In his role as ambassador for the Mayor’s Fund for London, Ball visited Sacred Heart Primary School in Wandsworth, to help inspire students to enjoy math, and give them hints and tips on how to play the 24® Game. “An understanding that maths is both fun and empowering is one of the most important things we can teach young people today,” explains Ball. “I am delighted to be working with the Mayor’s Fund for London to support Count on Us, which has identified key challenges for young people in getting to grips with numeracy." Boris Johnson, Mayor of London agrees. “A good grasp of maths is a vital skill for success in the job market. The Mayor’s Fund for London’s work with young Londoners will help improve their chances of getting a decent job, escaping the threat of poverty and playing a full part in London’s future as the greatest city on Earth." Count On Us was created as a result of a six-month investigation and study into the need for intervention to increase math skills among London students. 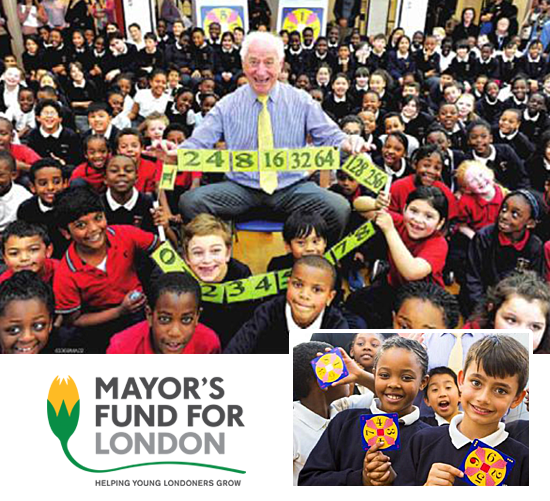 Commissioned in partnership with City Bridge and conducted by National Numeracy, the study helped to identify where the Mayor’s Fund for London could best make a difference to halt the decline in math skills at an early age. Research shows that each year, nearly one out of every five 11-year-olds in London left primary school with the math skills of a seven-year-old. The Mayor’s Fund for London’s exists to give young Londoners the skills and opportunities to get a decent job, escape the threat of poverty and play a full part in London’s future as the greatest city on Earth. Work focuses on helping young Londoners to be engaged, healthy and motivated to learn; offering extra support for core skills which employers say are absolutely essential (particularly numeracy and literacy) and supporting employers to create decent and sustainable career prospects for young Londoners. EASTON, PA—Robert Sun, First In Math inventor, is often invited to speak and write about issues and philosophies related to mathematics education. An article written by Sun was recently published in the National Council of Supervisors of Mathematics (NCSM) newsletter. It begins by featuring a Philadelphia school’s First In Math success story. Baldi Middle School ended the First In Math 2012-2013 season ranked #5, as students solved more than 17 million math problems correctly in just ten months. Even though Baldi is located in an economically challenged neighborhood, they sustain a high-performing culture characterized by three traits: the children feel attached to their school and its mission; the environment supports productivity and performance; and students are energized to sustain accelerated effort over time. The how and why of these accomplishments, according to Sun, begins with a concept known as Deep Practice—a practice loop where proficiency is attained through immediate awareness of success or failure. This type of learning is evident in sports, music and other pursuits that engage our senses. When solving math problems, however, there usually is no similar form of encouragement. First In Math addresses this challenge by creating a Deep Practice loop to provide immediate, non-judgmental feedback. Students are motivated to tackle a complex subject in manageable parts. They can stop when an error occurs, practice one skill until it is perfected and eventually, achieve mastery. This is the hallmark of Deep Practice. The benefits of this type of mastery extend to other vital skills—problem solving and critical thinking among them. Successful critical thinking is difficult, because the human brain was not designed to think but evolved to process vast quantities of visual information. Computers can now beat the best human players in chess, but we have yet to design one that can steer robots over uneven terrain or drive a truck—that’s how complex it is to process visual information. Yet for the human brain, it’s a task that is preferable to thinking. Sun goes on to explain that the portion of our brain allocated to thinking, the neo-cortex, commonly referred to as the “working memory,” is limited. That’s why when we overtax our working memory our ability to reason slows or may break down altogether. What we experience through our senses enters into our working memory, but we also draw from a storehouse of accumulated knowledge—our long-term memory. If our goal is to enable students to think critically, and thereby approach math with rigor and focus, they must be offered repeated practice to build automaticity and insure that that their long-term memory contains comprehensive factual knowledge related to mathematics. Sun encourages educators to think of long-term memory as a pantry. When a child’s pantry is sparse, he cannot perform up to expected standards. Stocking the pantry with knowledge is essential if we want children to think critically. Although children are exposed to vast quantities of information from birth, it is only when they are actively engaged and thinking that this information becomes stored in their long-term memory. Passive styles of teaching can be likened to laying important ingredients on a table and hoping that students will be motivated to collect them and add them to their pantry. However, when a student is not actively engaged, those items never get into the pantry, they pile up and eventually fall off the table’s edge. Studies confirm that 90 percent of what a child is taught in class is forgotten within 30 days. First In Math avoids this treadmill by providing students with an opportunity to take ownership through active engagement. Suntex International Releases First-Ever 24® Game App on iTunes! EASTON, PA—“We are pleased to announce that anyone looking for a mesmerizing math challenge can now download a Single-Digits version of the popular 24® Game from Apple’s iTunes App Store” says Suntex Vice President Barbara Asteak. Previously, the only electronic versions of any 24 Game appeared in the Skill Set™ modules on the First In Math® Online Program web site. The 24® Game Single Digits app was launched in December, 2010, and is compatible with iPhone, iPod touch and iPad devices with iOS 3.2 or later. The original Single Digits card game debuted in 1988, and eventually inspired nine other editions, as well as the 24 Challenge® Program and the creation of the First In Math® Online Program. The “i” version of the Single Digits game plays like its card-game predecessor and FIM cousin, but players are ‘on the clock.’ Students can play to beat their own best time, or challenge friends to see who is the quickest—Current Time and Best Time are displayed. Play is simple—make the number 24 using all four numbers on the electronic card. Add, subtract, multiply or divide but use each number only once. As players solve cards, blue bars within a small “strength meter” record the number of successful completions; after eight correct plays the game ends and records the elapsed time. Games offer three levels of difficulty, indicated by dots. The App store lists the game for ages 4 and up, but is probably more appropriate for ages 9 and up. The app costs 99¢ per download and is compatible with iPhone, iPod touch and iPad devices with iOS 3.2 or later. In 2012, the 24® Game will celebrate its 24th anniversary, continuing to help children sharpen basic math skills such as computation, problem solving, number sense, critical thinking, and pattern sensing. Used in more than 600,000 classrooms throughout the United States and abroad, the 24® Game, and the First In Math® Online Program, are helping to create a new generation of students become critical thinkers and problem solvers. BETHLEHEM, PA—Some of Daniel Manbeck's memories of the 2000 Pennsylvaina State 24 Challenge® finals are sketchy, but he remembers one thing very clearly—how excited he was to meet 24® game inventor Robert Sun, and to pose for a picture with him after the event. Ten years ago, Manbeck was a 5th-grader at Mifflinburg Area Middle School enjoying that moment. Little did he know that in 2010 he would end up working for Sun! "I wanted to do an Internship during the summer," explains Manbeck, now a Junior and Computer Science & Business major at Lehigh University. "I saw a posting on the Lehigh Career Services website for a programming internship, and could not believe my eyes when I saw where it was—at Suntex, Robert Sun's company!" A few phone calls and a few weeks later–with the old, faded picture of himself and Sun tucked into his briefcase–Manbeck walked through the door at Suntex for an interview. "From the beginning of the interview, we felt Dan would be a great fit for us here at Suntex, but when he told us about his 24 Challenge® experiences, we knew we had to find a spot for him," laughs Suntex Executive Vice President Nan Ronis. THEN: Manbeck with Sun after placing third at the 2000 24 Challenge Pennsylvania State Finals. NOW: Cramming three computers into his small workspace at Suntex headquarters in Easton, PA, Manbeck tackled a variety of projects during his internship. According to Manbeck, the internship has been a great opportunity to work in a professional environment and improve his skills in the rapidly-expanding field of web development. He spent nearly three months helping program and test content for Sun’s First In Math® Online Program, which is based on the 24® Game. Adapting the site’s existing Equal Length and Equal Weight games to include additional Metric and Mixed units of measurement involved generating the huge databases of information that ‘do the math’ for these games. “Working for someone who is an inventor like Bob is pretty amazing, because he really thinks on his feet and you have to keep up and problem-solve on the fly—it can get pretty intense. But I learned that if reaching a better solution means scrapping what you've already done and working harder, then that's what you need to do. It certainly is an experience that I will carry with me through college and into my career." Fellow Lehigh alum and Suntex Senior Systems Architect Jason Walters enjoyed working closely with Manbeck. "Dan's very enthusiastic about whatever he's doing, he’s a quick learner and a great guy. I am sure that he will continue to work for us now and again on special projects in the future." After mathematics, Manbeck's second love is music, and he is currently the Assistant Manager of the Lehigh Univeristy Choir, a member of the Percussion Ensemble and performs with the Wind Ensemble. When he graduates from Lehigh, Manbeck says he is not 100% sure what path he will choose. But wherever he goes, he says he'll probably have that old picture of Bob and a funny-looking 5th-grader on his desk. The colorful Suntex booth incorporated six computers, allowing educators to fully experience the First In Math program as a student or teacher. Suntex President and CEO Robert Sun says he always looks forward to attending to “share our vision of the success students can achieve with those who may never have heard of us,” and also to hear what loyal users of the 24® Game and the First In Math program have to say. Many teachers who visited the Suntex booth for a demonstration stayed to pose for pictures with First In Math creator Robert Sun. There were also stories that moved Sun—among them an Orange County, Florida teacher explaining that her ‘hotel’ kids (from families who have recently lost their homes due to tough economic times) are staying in school an extra two hours at day’s end to work on the First In Math program. Helping to spread the word were Vice President Barbara Asteak, customer specialists Nancy Kane, Cynthia Anderson and FIM Texas rep Tony Morrow, who loves doing site-demos. Kane also handed out three 24® Game/ First In Math® daily prizes, won by teachers from Nova Scotia (Canada), Arizona and California. 24 Challenge® Greetings from Ngomeni, Kenya! KENYA, AFRICA—Chris McKeown is a United States Peace Corps Volunteer currently living in the village of Ngomeni, Kenya. McKeown grew up in the small town of Hellertown, Pennsylvania, and graduated from Saucon Valley High School in 2004. He graduated from the University of Maryland in 2008 before joining the Peace Corps. "My family recently came to visit me in Kenya, and brought a 24® Game," says McKeown, who began using the game with his students every day after school. They enjoyed it so much, McKeown decided to set up a 24 Challenge® tournament. Top left: Chris McKeown sorts decks in preparation for the 24 Challenge® event. Top right: Players listen intently to see if the solution offered is correct. Bottom: The crowd stays close to the action as students try to solve a tough Variables card. "At first, I just wanted to let everybody back home know that the 24® Game is popular even in a small rural village in Kenya," says McKeown, who contacted 24® Game inventor Robert Sun with the news. Sun replied, donating a 24® Game Tournament Kit and offering encouragement. McKeown soon realized that the Tournament was becoming something important, something that his students really took pride in. "Our school is young, and we don’t have many resources—these kids don't often get to be a part of an event like this. For six weeks prior to the Tournament, they practiced almost every day after school for at least an hour. On a typical day a minimum of ten students out of our total of 28 attended practice," says McKeown, adding that the practice sessions become very competitive, and made for a great build-up to the Challenge. Word spread quickly, and on October 31, the tiny school was ready. "We ultimately had 15 students decide to compete," says McKeown, who enlisted the help of another Peace Corps volunteer, Maryland native Tameisha Henry, a graduate of The American University, to help organize the event and act as head judge. "The event was intense, but in a really fun way. We were able to get great prizes and had a nice-sized crowd watching, so my students were focused on performing their best. Each time we announced which students would be advancing there was a buzz in the room." "I heard people talking about it for days afterward, and many students told me that it was a day that they will never forget," says McKeown, who describes the event as a 'tremendous success'. I just want thank Suntex, and to let you know that the 24® game made a huge impact at our school. I am personally forever grateful." WAYNE, NJ—Joshua Mindler says he always had a talent for math, but participating in the 24 Challenge® really brought out his passion for mathematics. "Preparing for the competitions drove me to study and work harder, to rise to the level of competition I was facing," says Mindler. As a Northampton Junior High School 7th grader, Josh placed second in the Lehigh Valley regional tournament, and second at the Pennsylvania State tournament. In 8th grade, he won the Lehigh Valley tournament, and placed second again at the State event. "Along the way," says Mindler, "my teachers greatly encouraged me and provided an environment that allowed me to prosper. Their encouragement ranged from having in-class competitions to coming with me to 'states' and other tournaments." According to Mindler, "the skills I learned playing the 24® Game helped me tremendously when it came to algebra and calculus later in my mathematical career. To this day, the ability to deliver a quick response and apply mental-math skills greatly affect my daily life—everything from calculating a tip on a check to finding the estimated power correction factor for some of our components." Mindler was hired at BAE Systems into the Engineering Leadership Development Program in 2008, after graduating from Syracuse University with degrees in both Aerospace Engineering and Mathematics, with a focus in Applied Statistics. BAE Systems is a global company engaged in the development and support of advanced defense, security and aerospace systems in the air, on land and at sea. "I am having a great time here, working on multiple interesting projects," says Mindler. "Currently, I am working on a project installing communication equipment onto Bradley vehicles (tanks). I am doing some of the networking and problem-solving associated with that." Another of Mindler's projects entails placing networking equipment on Air Force 2’s—with the potential to be used on Air Force 1, the President's plane. "This project involves knowing the system configuration and ruggedizing the equipment for harsh environments," explains Mindler. “I am also writing graphic user interfaces (computer applications) for a multi-layer security switch, which can separate 'unclassified' from 'top-secret' data on the same switch.” Concurrently, Mindler is the lead for a process improvement team where he creates and follows statistical models for quantitative process improvement. Mindler is quick to point out that his exciting career would not have been possible without a good education, lots of hard work, and, of course, great math skills. "I feel as though the 24 Challenge program had a great impact on my life, and I probably wouldn’t be where I am today without the skills and mental capacity that I gained through playing and practicing those 24 games!" NORRISTOWN, PA—On May 21, Norristown Area School District's administration building was teeming with students eager to participate in one of the most exciting and rigorous math tournaments around—the 24 Challenge. According to District Curriculum and Instruction Supervisor Donna Runner, the 2009 tournament was the district's 12th annual event. Runner organized this year's contest with the support of math specialists from each building. "The 24 Challenge is always one of our most exciting academic endeavors," says Runner. "Students, parents, teachers...so many people get involved, it's really great to see." Students competing at the district-wide event were already winners at their individual schools, and were accompanied by their math teachers or coaches. Dobson has high praise for the Norristown district. "I can't say enough about the energy that the Norristown folks have put into this program, and Donna has raised the tournament experience to a whole new level. The event is child-centered, and presents students with a safe, comfortable environment and appropriate resources to enhance their learning." The meticulously-organized event included playing tables covered with balloons and decorations in "24" colors, a magnificent display of trophies and prizes, and an outdoor "picnic" lunch for participants. Even mother nature cooperated with a near-perfect day. NAZARETH, PA—Lower Nazareth Elementary School students gathered for their school’s annual 24 Challenge® Math Tournament on May 11, 2009. Mathematics Specialist Alton Mann and the entire LNES 5th grade staff helped organize the event, and Mann proctored the final Championship Round of play. “Everybody in the whole room had their eyes on that table,” according to Mann. Fifth-grade teacher Stacey Spering served as a volunteer proctor, and was impressed with what she saw. “Every student in this room today is a winner,” says Spering. All participants received 24® Game wristbands. Champions at each level each received a 24® Game Keychain and a First In Math® Lanyard and were also presented with enormous Hershey’s chocolate bars, courtesy of Mr. Mann. Grand Champion Jacob Brown was awarded a Gold Medal, and a travel-sized deck of game cards signed by 24® Game inventor Robert Sun. “This time of year, elementary and middle schools all across the country are gearing up for their own tournaments—sharpening their math skills and having lots of fun in the process,” says Suntex Account Manager Cynthia Anderson, who attended the event. Anderson also recently visited Nazareth School District’s two other elementary schools, Bushkill and Shafer. “All of these talented students would normally move on to a District Competition held at the high school, unfortunately time constraints may prevent that from happening this year,” explains Anderson. Stacey Spering and Alton Mann join (l to r): Alison Smith; Adam Hohner; Tanner DePalma; Jacob Brown (Champion) and Thomas Simone. AMBLER, PA—Students, parents and siblings turned out in large numbers for Math Night at Lower Gwynedd Elementary on March 3. Students and their parents sampled twelve different Math activities, and the First In Math Online Program was the top draw, according to FIM Ambassador Cred Dobson. "Math Night was a blast at Gwynedd! We had three tables with 15 laptops at our station." Left: Lower Gwynedd students and their parents check out the FIM site on Mac laptops. Top: Staff Developer Toby Grosswald and Elementary Curriculum Supervisor Dr. Kevin P. McAneny. Bottom: Principal Lawrence J. Feeley. Lower Gwynedd Interim Principal Lawrence J. Feeley agrees that one of the most popular locations was indeed the First in Math Table, manned by Dobson, his wife Jennifer, and Lower Gwynedd Staff Developer Toby Grosswald. "Empty seats quickly filled as all were eager to participate, and to hear about First in Math." Feeley, who credits more than 20 staff members with the evening's success, says he is "hoping that future Math Nights at Lower Gwynedd Elementary will find Mr. and Mrs. Dobson back with us to share some of that First in Math excitement!" Dr. Kevin P. McAneny, Elementary Curriculum Supervisor, also attended the annual event, which seeks to involve students and their families in an evening of math fun and adventure. Another way the school involves family members is through a component of the First In Math program know as "Family Link". Family Link allows parents and siblings access to the site, providing a mechanism for students and families to spur each other on to greater mathematics achievement. Dobson's wife, Jennifer Hawkins, a School-Based Math Teacher Leader at C. W. Henry ES in Philadelphia, attended Math Night to help out at the FIM station, and liked what she saw. "Lower Gwynedd students show a real enthusiasm for learning and willingness to try new things, and I saw lots of encouragement and support from both staff and parents. Kudos to Ms. Grosswald for getting such a wonderful turnout at this math event!" LITTLE ROCK, AR—Representatives from the First In Math® program attended the inaugural Conference on the Mathematics Teaching, Learning, and Research of African American Students November 13-14. The 2008 conference, sponsored by the Benjamin Banneker Association, was titled "Unlocking the Doors of Excellence in Mathematics for African American Students." "The conference was a wonderful way for teachers and exhibitors to share ideas and work on mathematics excellence, including ways to close the achievement gap," says FIM Support Specialist Nancy Kane. FIM Ambassador Cred Dobson, agrees, adding "The professional excellence of this event was a thing of beauty—kudos to Conference Chair Vanessa Cleaver." Benjamin Banneker was born in Maryland in 1731. The son of a former slave, Banneker did not let race nor age hinder his quest for intellectual development. He was a farmer, scholar, mathematical wizard, astronomer and surveyor. At age 58, Banneker taught himself the science of astronomy; making projections for solar and lunar eclipses and computing tables on the locations of celestial bodies for almanacs. Also a social activist, Banneker wrote a long letter to then Secretary of State Thomas Jefferson—in which he made a case for equality for African Americans—that was given wide publicity. In 1980, the U.S. Postal Service issued a postage stamp to honor his achievements as the first African American scientist. SOMEREST, NJ—Association of Mathematics Teachers of New Jersey (AMTNJ) President John Hammett presented a plaque to 24 Game inventor Robert Sun at the association's annual conference, held at the Somerset Crowne Plaza Hotel on October 23 and 24. Past President of AMTNJ and long-time 24® Game supporter, Joan Vas, poses with Sun and the plaque, which states: "The Association of Mathematics Teachers of New Jersey Gratefully Acknowledges the Financial Support of SUNTEX International Inc. for Special Events at the AMTNJ Two-Day Conference, Somerset New Jersey, October 23-24, 2008." During a Suntex-sponsored breakfast on the morning of the 23rd, Sun spoke to educators about the First In Math® Online Program. "It was really exciting to speak with so many enthusiastic educators," said Sun, who also said he was completely surprised by the acknowledgement. "In accepting this beautiful gift on behalf of Suntex, I want to thank all of our long-time friends at AMTNJ, as well as all of the new friends we've made here in New Jersey," said Sun. The theme of this year's two-day event was "Making Math Meaningful." 24 Challenge® News from Down Under! MELBOURNE, AUSTRALIA—Australia got it's first taste of 24 Challenge® excitement with a mini-event held at Forest Hill College in June, 2008. The competition was sponsored by Brainy Days, an online toy and game store that is the exclusive source for all things 24® in Australia. "We are proud to be involved in this inaugural event, which has seen one of the most successful maths tournaments in the world come to Australia," says Brainy Days' Director Lyell Purcell. "What makes this tournament unique is the buildup to the event, which encourages all students to develop and stregthen foundations in their understanding of maths literacy." In addition to providing 24® game materials free-of-charge to schools, Brainy Days also provided medals and certificates to students. Three more events, North/West Melbourne Region-September 2; Eastern Melbourne Region-September 3 and the Southern Melbourne Region-September 4 allowed hundreds of children to participate. Click here for more coverage on the Brainy Days website! LEFT PHOTO: Year 3/4 Semi-finalists, l to r: Jasper Chen (Livingston Primary); Isaac Vanrossen (Mountain District Christian School); Michelle Huang (Parkmore Primary) and Nethmi Ekanalyake (Clayton Primary). RIGHT PHOTO: Champions, l to r: Year 3/4 Ken Xie, Year 5/6 - Henry Cui , Year 7/8 - Khoa Nguyen. ATLANTA, GA—Raina Jain, a freshman at Freedom High School in Bethlehem, Pennsylvania, has become the youngest high-school student in the world to win an award at the prestigious Intel International Science and Engineering Fair. Jain, who celebrated her 14th birthday during the five-day event in Atlanta, was just 13 when she entered the competition. The Intel ISEF is the crowning achievement of science competitions around the world, and students from more than 50 countries participated. If this all sounds somewhat familiar, it is because last year Raina's sister, Isha, won a grand prize in the Zoology category of the Intel International Science and Engineering Research Fair. Isha will attend Harvard University this fall. "It was absolutely amazing," Raina says of her five days at the 2008 Intel event. "I got to meet kids that are just like me; they love science." Jain's mother Sweety, a family practice physician at Lehigh Valley Hospital-Allentown, is very proud of both her girls, and points out, "we are a science family." Her husband, Himanshu Jain, a materials science engineering professor at Lehigh University, agrees, adding, "it's great—we must be doing something right." Both sisters are also former 24 Challenge® Pennsylvania State Champions—Isha in 2003 and Raina in 2004. "When I first met both of these girls, I knew they'd go on to do special things," recalls 24® Game inventor Robert Sun. Raina is an incredibly hard worker, and has taken high school classes since eighth grade. On the road to Atlanta, Raina won first place in the engineering category and a silver in all 13 categories in the regional science fair competition. She has also won special awards from the Society of Women Engineers, Centocor Inc., the Pennsylvania Society of Professional Engineers and the most recently the Parenteral Drug Association on June 17. Is there any rivalry between the two science-whiz sisters at home? "Not really," according to Raina. "The real rivalry is clothes," says big sister Isha, "definitely clothes." TRENTON, NJ—Friday June 13 turned out to be a lucky day for more than 75 Trenton Public School District students, as they made it to the finals of a district-wide 24 Challenge Tournament. "This year's 24 Challenge Tournament was great. Everything worked very well, and we had 15 teams from different schools compete," said event organizer Debra T. Cunningham, Instructional Technology Teacher Specialist for the Trenton Public School District. "Next year, I hope to have our tournament earlier in the year, and then host a Mercer County Regional Tournament in June." Students and teachers alike enjoyed the 24 Challenge event. "We are serious about mathematics education, and also have more than 60 Teams engaged in the First In Math Online Program," says Cunningham, who coordinates the program for the Trenton Board of Education. Parker Elementary School was once again a Garden-State powerhouse, with it's top team, "Snow52NJ" placing #1 in NJ and #14 among the nation's Top 100 Teams. Parker ES boasted the #1 team in the nation, all grades, in the 2006-2007 school year (read story). PITTSBURGH, PA—Sometimes referred to by it's Principal as 'the Miracle on Greenridge Drive,' St. Gabriel of the Sorrowful Virgin School is home to the nation's #1 eighth-grade First In Math Team for the 2007-2008 school year. Team "Boss50PA" is also ranked #7 nationally, all grades, according to Suntex Vice President Barbara Asteak. Asteak paid a visit to the school in May to attend a special celebration, along with FIM Program Director Mark Losey, himself a Pittsburgh native. "This is one of our school's proudest moments," said Principal Barbara Sawyer. The Allegheny county school has also participated in many local 24 Challenge® tournaments, and in 2003 and 2004, St. Gabriel students made it all the way to the semi-final round of the Pennsylvania State Championships. Left: Team Leader Lois Doerfler and Brett Dadig. Right: Team Boss50PA, which also included two advanced 5th graders and several 6th and 7th graders, poses along with Principal Barbara Sawyer (back row). As the only non-tuition school in the Diocese of Pittsburgh, St. Gabriel is demanding of any curriculum supplement it chooses. "What a great teaching tool First In Math has become" says Sawyer, pointing out that all five of their teams had 100% activation. "We wish to applaud Suntex for providing an outstanding way to motivate students so thoroughly that they beg our math teacher to teach them more!" "Boss" Team Leader Lois Doerfler agrees, explaining that interest in the competition accelerates the learning process. "Because students want to solve more levels of the game, they're actually asking to learn something in math," says Doerfler. Brett Dadig, the team's # 1 player, has earned more than 18,300 stickers since September. LOS ANGELES, CA—Robert Sun , inventor of the 24® Game and creator of the First In Math® Online Program was presented with a 2008 Asian Entrepreneur of the Year Award at a May 23rd event hosted by Asian Enterprise Magazine. Sun, who serves as Chairman and CEO of Suntex International Inc., was handpicked by the Awards Committee for being a source of inspiration for the Asian Pacific American business community, and was recognized in the Engineering category. Sun accepts his award from publisher of Asian Enterprise Magazine WiIly Borromeo, left, and then addresses the audience. The 15th Annual Awards Program and banquet—themed “In Pursuit of Excellence"—was held at the historic Millenium Biltmore Hotel in downtown Los Angeles. According to Asian Enterprise Magazine, "It is our way of recognizing exemplary leaders who have stood behind the spirit of Asian Pacific American small business enterprise." Sponsors of this year's event included Walmart, Pepsico, Sodexho, The Coca Cola Company, IBM, Chrysler, Harrah’s and Morgan Stanley. Master of Ceremonies was Angela Baraquio-Grey, Miss America 2001. A former teacher, Baraquio-Grey founded a non-profit organization that promotes education and provides scholarships to students and teachers. Corporate representatives from Fortune 500 companies and political figures were present at the event, and Ralph Alvarez, President and COO, McDonald's Corporation, was the keynote speaker. Other notable AEY recipients included: Overall winner Dr. Karen Eng; Governor Bobby Jindal, State of Louisiana - Public Servant Advocate; Indra Nooyi, Pepsico CEO - CEO Advocate; Jim Skinner McDonald's Corp. CEO - CEO Advocate and Esther Silver-Parker, Senior Vice President of Diversity Relations, Walmart - Special Advocate. CONCORD, NC—“Try your best and practice,” says eleven-year-old Quade Robinson, who finished first among 180 middle school students competing at the Cabarrus County Schools 24 Challenge® Wednesday, April 30, at the Boys & Girls Club of Cabarrus County. Robinson attends C.C. Griffin Middle School in Concord. Given the recent success of the elementary school challenge, ( See story below ) middle school teachers Karen Abraham from Northwest Cabarrus and Jennifer Riordan of Mount Pleasant approached tournament organizer and Cabarrus County Schools Education Center's AIG Coordinator, Ann Burr, about hosting a middle school competition. “We needed something for our middle school kids to exemplify academic excellence,” says Abraham. Mary Beth Roth, the school system’s middle school director, said the 24® game helps sharpen students’ critical thinking skills. C.C. Griffin teacher Julie Coble agreed, adding that children involved in the 24 Challenge® tend to be self-motivated and enjoy playing the game in their spare time. Other finalists were Wyatt Taylor of Northwest Cabarrus; Harrison Rieff of Concord, and Toma Mamulashvili of C.C. Griffin. Each received gold medals. UPPER DARBY, PA—As the clock ticks toward the deadline for the First In Math Online Program National Top Ten Awards, St. Laurence School is becoming a force to reckon with in the program. The K-8 Catholic school is currently ranked #1 among all grades in the Philadelphia Archdiocese, and ranked #22, all grades, among more than 1,000 participating schools in Pennsylvania. In addition, 6th grader James O'Shea is the #3-ranked player in the nation, all grades, with more than 28,000 stickers. "I play four or five times a week for about 30 minutes," says O'Shea, explaining his strategy. "I like to choose the game at random and work on it until I finish the level. Most of the time it comes natural to me, but if I have a problem I stay with it until I solve it." Number one team in the Philadelphia Archdiocese, Vista61PA. James O'Shea holds the team's First In Math traveling trophy. St. Laurence School loves the First in Math Program, according to Math Coordinator Ann Char. "On April 11 we had a First In Math Marathon—every computer in the school was on the site. Every class had 30 minutes in the lab and classroom computers were available to the students as they finished their work. A group of sixth graders even opted to use the lab during lunch recess!" "Our Home & School Association pays for the program each year, and we are grateful for their support," says Principal Sister Helen Thomas. Teachers, students, and parents are all seeing benefits. "While students are enjoying the healthy competition, teachers find that students are not only mastering basic skills but are also motivated to become independent learners. Parents are enthusiastic that the children are engaged in a safe online activity." Recognition of the students' success plays an important role in the program, according to Char. "Our Principal encourages the students over the loudpseaker and gives regular updates on their progress. We also have a First in Math Wall of Champions where we post the leaders in each homeroom." "Saint Laurence truly believes in the FIM program, and in the 24® Game," says Char. "In addition to our FIM activities, we have an after-school club for children who wish to play the 24 game, and about 30 students stay after school on Mondays to compete using official tournament rules." The school is planning to host a mini tournament at its Academic Fair in May, with the hopes of expanding to a regional competiiton in Delaware County next year. In the past, when there were citywide 24 Challenge® tournaments, St. Laurence was always well represented. For several years, the Delaware county winner was a St. Laurence student. FISHERSVILLE, VA—The bleachers were filled with hundreds of family, friends and spectators as the Valley of Virginia Council of Teachers of Mathematics (VVCTM) and James Madison University held it's Second Annual Regional 24 Challenge® Tournament on March 31. Approximately 100 students from 17 elementary schools across Augusta County, Rockingham County, and Harrisonburg City Schools participated in the competition. VVCTM-JMU 2008 Champions, left to right: Sierra Reynolds; Grand Champion Jeff Bailey; Jordan Graham and Codie Mclainy. "This is a great opportunity to show everyone that we teach and emphasize computation skills in our elementary schools," says L. Harvey Almarode, Instructor of Elementary Mathematics Methods and Strategies in the College of Education at James Madison University. "Parents and visitors are amazed at the speed and accuracy of the competition." Almarode began conducting 24 Challenge® Tournaments in Augusta County 10 years ago when he was Mathematics Supervisor for Augusta County. "Upon my retirement from Augusta County and in my new job at James Madison University, I was asked to expand the event to a regional tournament and VVCTM agreed to fund the endeavor," says Almarode. Augusta County Schools funded the entire operation through Mathematics Instruction. "I am available to visit individual schools and assist teachers in conducting class, grade-level, or school tournaments. This year I organized 12 different school-based tournaments throughout the region, and am scheduled for five school tournaments at new schools in May." Suntex Vice President Barbara Asteak attended the competition, and came away impressed with what she saw. "This was a very unique event, in the way that technology was incorporated into the final rounds," explains Asteak. Semifinal rounds utilized document-cams and LCD projectors to display the game cards on large screens, allowing the audience to see the games being played. Representatives from Rochbridge County, Rappohannock County and Staunton City schools attended the tournament as observers, so they can start conducting their own 24 Challenge® event in the spring. As for Almarode, he says he's ready for 2009. "I am already making plans for next year with the inclusion of the Variables cards in the mix!" Cabarrus County Announces 2008 24 Challenge® Grand Champion! CONCORD, NC—On March 14, 2008, 142 students from all 18 Cabarrus County Elementary Schools had an opportunity to compete for the title of 2008 Cabarrus County Schools 24 Challenge® Champion. Cabarrus County Schools Education Center's Academically and Intellectually Gifted Coordinator, Ann Burr, says that the 24 Challenge Math Program is an excellent educational initiative that helps students develop mathematical skills such as pattern sensing, problem solving and mental math. "Research has shown that the 24® game is engaging and challenging mathematically, but most of all is fun for students. The kids absolutely love 24!" Weddington Hills Elementary Assistant Principal Adam Auerbach poses with Nicole and her trophy. After several rounds of tough tournament play, Dr. Colleen Sain, Assistant Superintendent for Cabarrus County Schools, presented the 2008 Champion's trophy to 5th grader Nicole. Congratulations to all the students that participated in this year's event, you are ALL winners! BOSTON, MA—The eleventh annual Harvard-MIT Mathematics Tournament (HMMT) was held on Saturday, February 23, 2008, at Harvard University. 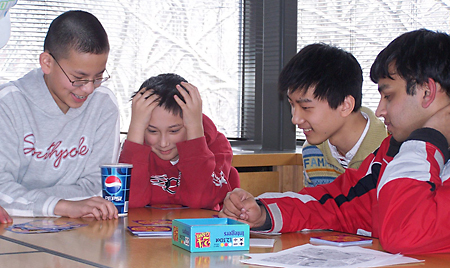 The HMMT is an annual math tournament for high-school students, held at the Massachusetts Institute of Technology (MIT) and at Harvard University in alternate years. It is run exclusively by MIT and Harvard students. With more than 700 participants competing in various events, HMMT is one of the largest math contests in the United States. Five individual tests—a General Test and four subject tests in Algebra, Geometry, Calculus, and Combinatorics, as well as two team events—comprise the major events of the tournament. A portion of the day is also devoted to numerous mini-events. "Our 24 Challenge mini-tournament was small—about 30 people participated—but all were excited to play the game," says Doris Dobi, who ran the event. "A lot of people even wanted to buy the 24 game decks from me afterward!" "On behalf of the staff of the 2008 Harvard-MIT Mathematics Tournament, I want to thank Suntex International for sponsoring us," said Yi-Hsin Lin, one of the 2008 Tournament Directors. "The Tournament was a great success, and I think all of the students enjoyed themselves." "As the developer of the innovative 24® Game, we are committed to supporting and enhancing math education," Asteak told the panel. "Five years ago, we combined our successful 24® Game series with the power of internet technology to create the First In Math® Online Program—a program with a proven track record of improving math skills and raising overall test scores." "It was an honor to speak in front of the National Mathematics Advisory Panel," says Asteak, from her Easton, PA office. "It is my sincere hope that EVERY student will someday have access to this wonderful program, which not only helps students develop an enthusiasm for learning, but fosters a belief in their ability to succeed." PHILADELPHIA, PA—The School District of Philadelphia's Northwest Region held it's own 24 Challenge® Tournament on May 23, 2007. The event, sponsored by First In Math® Ambassador Cred Dobson, was held in the auditorium of Leeds Middle School. More than 120 students attended from schools throughout the Northwest Region. Students in grades four through eight competed for Gold, Silver and Bronze medals, in addition to a hotly-contested Platinum Masters competition. Each student recieved a certificate, a "First in Math®" silicone bracelet and a Championship T-shirt for making it to the Regional Finals. Prince Hall Elementary teacher and "24" coach Hope Thomas and two of her students, fourth-grader Marcus Gary and fifth-grader Andre Stokes, share a moment as they wait for the tournament to begin. More than 50 parents and supporters attended the competition. Regional Superintendent Linda Grobman, Director of Instruction Jacqueline Greene and Director of School Services Stephen Spence were the official chairs of the event. Dobson, a retired Academic Coach in Mathematics for the Northwest Region, extended kudos to Regional and School staff members for stepping up to make the event an overwhelming success. "I'd like to give a special salute to the school Principals, for personally providing lunch for everyone," said Dobson, nodding to the Principals who dropped in to personally encourage their students. Left: Fifth-grader Mary Evelyn Saunders of Rowen Elementary states her answer, while fellow fifth-grader Ucheoma Ibegulem of Anna B Day Elementary listens intently to make sure it is correct. Right: NWR Director of Instruction Jackie Greene presented medals to many deserving recipients, such as Terrell Morris of Lingelbach, as the awards were announced. PHILADELPHIA, PA—More than 100 students participated in the School District of Philadelphia's Center City Region 24 Challenge® event on May 17 at the University of the Sciences Wilson Student Center. "Competition was pretty intense," said First In Math® Ambassador Cred Dobson. "There was one young lady in particular at a table I proctored who made mincemeat of some of the gentlemen. It was exciting to watch her play." Winners were awarded First In Math® bracelets and 24 Challenge® T-shirts donated by Suntex International, as well as a chocolate rose and a chocolate 'number 24' wrapped in school-district blue and white ribbon. Each student, proctor and principal received a t-shirt designed by an eighth grade student in the Arthur School, plus a certificate of participation designed and created by Mrs. Beth Roth, Center City Region Technology Leader. "Thanks go to Thelma Silber, School Growth Teacher at Chester A. Arthur School, who serves as "24" coach for the Center City Region, for organizing a great event for students," said Dobson. "Mrs. Silber was able to arrange sponsorship from companies including PECO, the Philadelphia Dance Acadamy, Everyday Mathematics and T-Shirtz Inc. to help defray the cost of the competition." "The Center City Region feels honored, and appreciates you rearranging your schedule in order to attend our competition," responded Silber, who also went on to thank all of the students and proctors for their participation. Left to right: School District of Philadelphia Collaborating Teacher of Math Alwina Green; Cred Dobson; SDP Coordinator Cynthia Powell and Thelma "24" Silber. MEDFORD, NJ—The First In Math® program received an overall Rating of "5 Stars" in the March/April Issue of the MultiMedia & Internet @ Schools E-newsletter. Written by Sally Finley, a Florida-based Gifted/Technology teacher, the comprehensive review details and rates features of the program. "This is one of the most innovative, creative, and challenging math tools I have seen in years," says Finley, who offers hints for classroom application and recommendations along with her comments. To access the article on the MultiMedia & Internet @ Schools website, go to www.mmischools.com, and click Current Issues. (If you are not already a MM&I@S member, you will have to sign in to access the full text of the review. BETHLEHEM, PA— There are always a few "24 kids" who make such a lasting impression that they are remembered even after many years have passed. 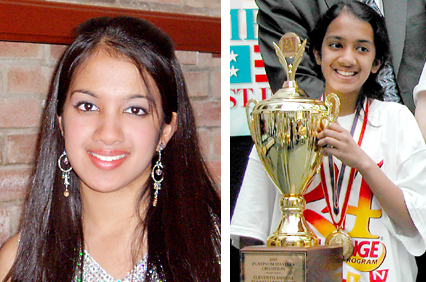 One such former competitor is Isha Jain , now a 10th-grader at Freedom High School in Bethlehem, Pennsylvania. Jain recently placed fourth in the Zoology category of the Intel International Science and Engineering Research Fair for her project, "Cell Proliferation is Episodic and Pulsatile During Growth of Zebrafish Fins". The energetic sophomore researched fin growth at the "fish lab" at Lehigh University to increase understanding of development that could be applied to humans. "My project involved looking at the rate of cell division within Zebrafish fin bone segments," explains Jain. "The goal was to understand the pattern of bone growth in this model system. The Zebrafish serves as an excellent paradigm for human morphological development." Isha, who has always liked math and numbers, outlined the role that her math skills played in her research. "There were two mathematical components in my analysis. I integrated (using rectangular approximations) the data sets and compared the ratios in two different bone rays with the ratio of their volumes. Also, to statistically verify the results, the F-ratio test statistic and the computer program Minitab was used." In addition to the prestigious Intel award, Isha has also garnered a United States Air Force 2nd place award, the Endocrine Society Honorable Mention Award and the Cook Group Incorporated award. Cook is the leading manufacturer of non-invasive medical devices and has offered Isha an internship to work on genetic experiments. Isha won the PA State 24 Challenge Championship Finals in 2003, competing at the Platinum Masters level. Her sister, Raina, was also a PA State winnner in 2004. Left, 15-year-old Isha plans to continue her research by analyzing fin growth mutants and the gene expressions of associated growth markers. Right, a young Isha hoists the 2003 PA State Platinum Masters trophy she won in Harrisburg. 2. Save to your download folder (or Desktop) as PDF files, or load directly into your web browser. 3. Print as many forms as you need. 4. Fax signed forms to: 610-258-2180, attention FIM NEWS & NOTES.